There of reports of fertile fronds being extremely wide and other reports with extremely narrow fertile fronds as shown here. It has been reported that the spore patches tend to fall off in a large patch. It is not known the reason for this habit as is would seem single spores would be more easily carried by the wind. P. coronarium can be a difficult plant to grow, however I understand that when established it tends to be a tough plant that will live for along time if not over watered*. In cool temperature locals, it is best to let the plant dry out in anticipation of colder temps and it will tolerate the cold better. This photo from Roy Vail illustrates the wide fertile frond version of the P. coronarium. The shield fronds are light green and show protruding veins. This platy appears young and may develop different characteristics as it matures. Frequently the shield fronds are a light green in color when compared to the fertile fronds. They are also waxy in appearance. The margin around the bud is turned back and ruffled. 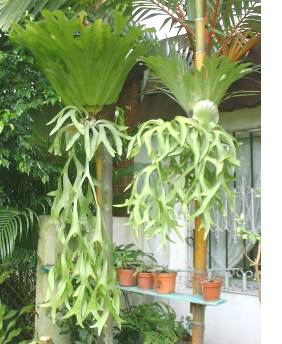 In the top photo, the fertile fronds are light green and the shield fronds are darker in color. 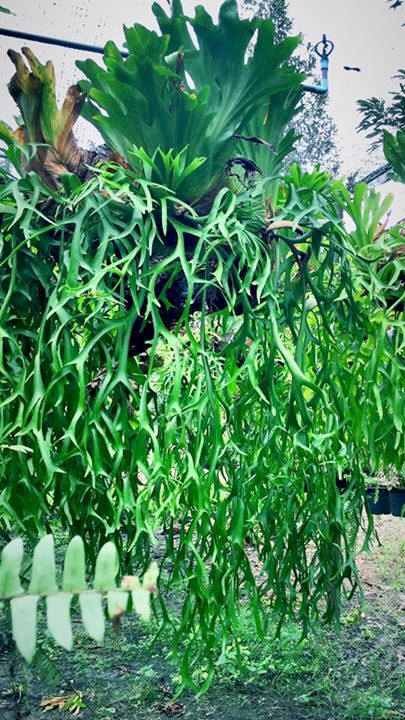 The shield fronds of the P. coronarium are very thick and corky, about 1.2 CM or 1/2 inch thick making it light weight and easy to over water. 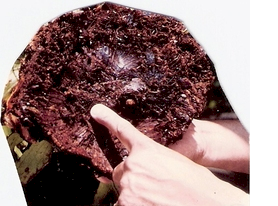 Roy Vail suggests P. coronarium shields may tend to attract ants, which provides protein and minerals for the plants. The spore patch is kidney shaped and found on the concave underside of the round, heart-shaped, thick stalked fertile lobe. P. coronarium and P. ridleyi are the only two plants with separate stalked fertile lobes. P. coronarium does not produce a spore lobe on each of the fertile fronds like P. ridleyi. The P. coronarium is uniquely different from other species in the growth of the rhizome. The rhizome, back in the moss and away from the bud, branches to the side and peaks out through the shield frond to grow a new pup. This keeps the new pups the same distance from the ground as the mother, forming a ring of P. coronariums around the host tree. When growing P. coronarium in cultivation, one must plan for this rhizome growth by mounting on a wire basket or on a board where the rhizome is below the board and has unobstructed room for growth. The photo on the right illustrates how the P. coronarium form rings around it's host tree. With the lobed shield fronds, they tend to resemble a crown. Thus the name P. coronarium. There are reports of a dwarf P. coronarium, however there is little agreement about its traits and the smaller versions may be a result of its growing environment. 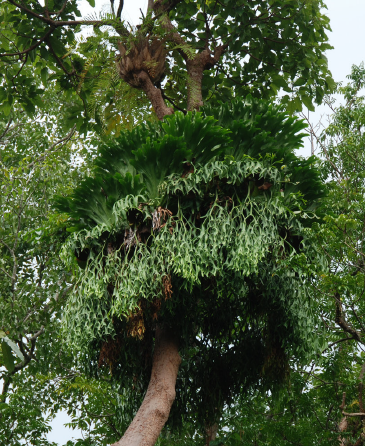 Jack Wood reports that the smaller P. coronarium in Malaysia could only catch small debris in the shield fronds and tended to be smaller plants. Peterne Katai, I believe in Thailand.